Citation: Cúrdia Gonçalves T, Barbosa M, Monteiro S, et al. Exploring hemostatic alternatives for Dieulafoy’s lesion. J Gastroenterol Dig Dis. 2018;3(1):12-13. Dieulafoy’s lesion is an infrequent, but potentially life-threatening, vascular abnormality. Although the conventional hemostatic therapies are generally effective, rebleeding can occur in up to 40% of the cases. We report a case in which rebleeding from a Dieulafoy’s lesion was controlled with the hemostatic powder TC-325. Dieulafoy?s lesion is an infrequent, but potentially lifethreatening, vascular abnormality, accounting for just 2% of the gastrointestinal bleeding. From a pathophysiologic point of view, it is caused by an abnormally dilated submucosal artery that erodes the overlying gastrointestinal mucosa without an associated erosion or ulcer. It is more frequently found in the lesser curvature of the stomach and the most common presentation is acute, painless, and intermittent, massive gastrointestinal bleeding. A Dieulafoy?s lesion should be particularly suspected when a patient presents several episodes of upper gastrointestinal bleeding with no visualized source identified during upper endoscopies . Although it is now well accepted that the first-line treatment is endoscopic, several different hemostatic methods have been progressively reported, such as hemoclips, bipolar electrocoagulation, argon plasma coagulation, band ligation and, more recently, hemostatic powders . We report a case of a 67-year-old male patient, with past history of subtotal gastrectomy for peptic ulcer disease complicated with perforation, which presented to the Emergency Department with hematemesis and melena and a 3 g/dL decrease in the hemoglobin value in the past 8 hours. After initial evaluation and resuscitation, an upper endoscopy allowed the identification of a non-ulcerated bleeding vessel, with spurting hemorrhage, in the anterior wall/lesser curvature transition, in a peri-anastomotic region, initially controlled with adrenaline injection and placement of 3 hemoclips (Figure 1). Four days later, due to continuous decreasing of the hemoglobin value and melena, upper endoscopy was repeated, revealing oozing in the same location and 2 in situ hemoclips. Due to persistent active bleeding even after repeating adrenaline injection and hemoclips placement, the hemostatic powder TC-325 (Hemospray®, Cook Medical) was used, successfully controlling the bleeding (Figure 2). The patient was discharged after 4 days, with no clinical or laboratorial evidence of rebleeding, which was confirmed in the outpatient clinic after 3 months. 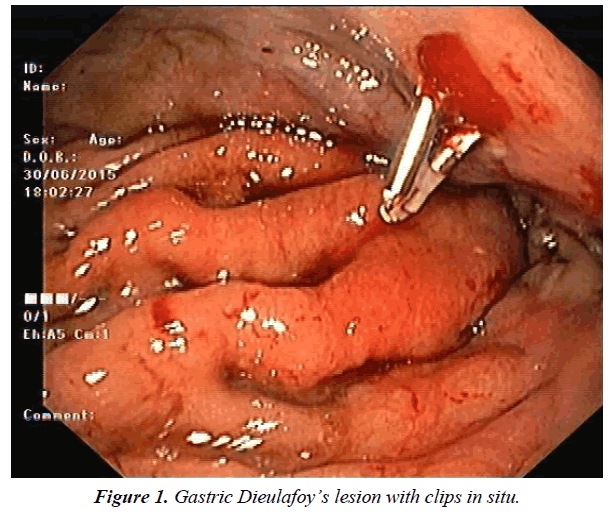 Figure 1: Gastric Dieulafoy?s lesion with clips in situ. Figure 2: Gastric Dieulafoy?s lesion after the use of hemostatic powder TC-325 (Hemospray®, Cook Medical). Despite the initial success rate of the thermal or mechanical therapies used in Dieulafoy?s lesions being generally more than 90%, rebleeding is reported to occur between 4% and 40% of the cases . Therefore, it is essential for the practicing endoscopists to be familiar with a wide range of hemostatic tools. In the last years, different hemostatic products, such as EndoClot (AMP, EndoClot Inc.), Ankaferd Blood Stopper (ABS, Ankaferd Health Products Ltd.) or TC-325 (Hemospray®, Cook Medical) have been introduced in the endoscopic management of gastrointestinal bleeding . While mostly used in peptic ulcer bleeding or cancer-related bleeding, experience with the use of these hemostatic powders in other less common bleeding lesions has been recently growing. The authors report a case that emphasizes the usefulness and efficacy of an alternative hemostatic method - the hemostatic powder TC-325 (Hemospray®, Cook Medical), in the treatment of Dieulafoy?s lesions, particularly as a salvage therapy when rebleeding occurs and the conventional methods are ineffective. Shin HJ, Ju JS, Kim KD, et al. Risk factors for Dieulafoy lesions in the upper gastrointestinal tract. Clin Endosc. 2015;48(3):228-33. Tjwa ET, Holster IL, Kuipers EJ. Endoscopic management of nonvariceal, nonulcer upper gastrointestinal bleeding. Gastroenterol Clin North Am. 2014;43(4):707-19. Nojkov B, Cappell MS. Gastrointestinal bleeding from Dieulafoy's lesion: Clinical presentation, endoscopic findings, and endoscopic therapy. World J Gastroenterol. 2015;7(4):295-07. Chen YI, Barkun AN. Hemostatic powders in gastrointestinal bleeding: A systematic review. Gastrointest Endosc Clin N Am. 2015;25(3):535-52.